Officials of the marine police Brunsbüttel subjected the "Ternvind" to a special MARPOL control in the oil port Brunsbüttel on Jan 9, 2019, after its arrival from Plymouth at 4.40 a.m. in order to verify the compliance with internationally established standards for the protection of the environment. When checking the maintenance intervals for the wastewater treatment plant, the police found that there had not been enough maintenance of the plant which was very dirty. Furthermore, it was noticedthat important lines of the system were clogged. Samples taken from the waste water tanks gave no evidence of the disinfectant chlorine. 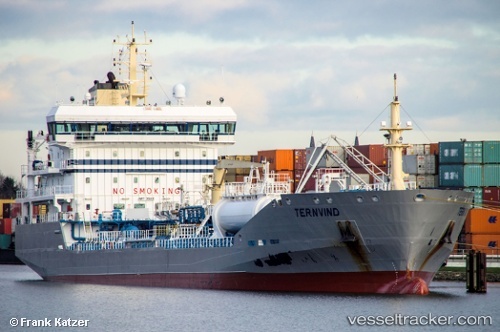 Therefore, the officials continued to investigate and found that the tanker had not drained enough disinfected wastewater into the German territorial sea. The officers initiated a fine procedure against the engine operator responsible for the system on board. The Federal Maritime and Hydrographic Agency set a security deposit of 800 Euros. After clarifying the formalities, the ship was allowed to continue at 6.30 p.m. to Hamburg. It berthed at the Kattwyk Oiltanking at 9.40 p.m. the same day.